You need to acquire a "Student" visa in order to study at SOKENDAI. For the visa acquisition, you have to apply for the visa in person at the Japanese Embassy or Consulate nearest to your residence in your home country. It usually takes no less than 3 months for issuance of the visa. This long process can be shortened with a Certificate of Eligibility (COE). 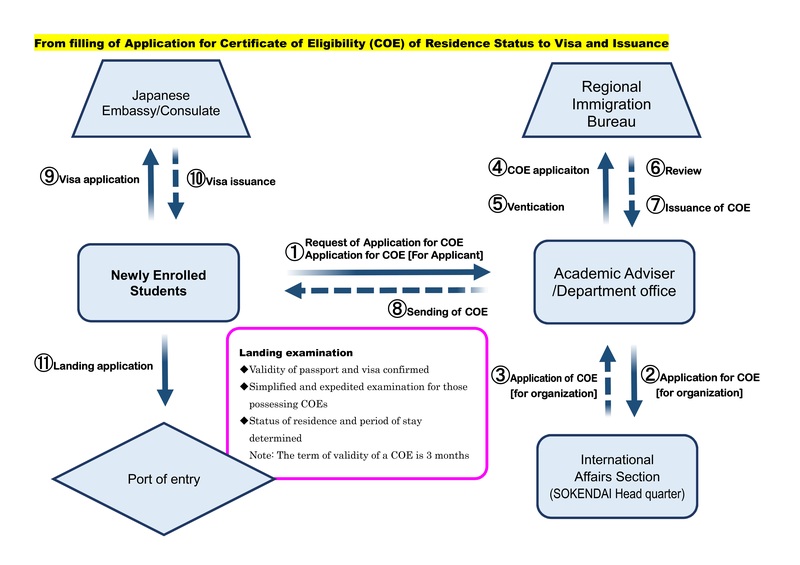 A COE is issued before the visa application by the regional immigration authority in Japan, as evidence that you fulfill all the conditions of the Immigration Control Act, and thus by showing the COE to the Japanese government officer in your home country, you can obtain the visa more easily. Therefore, we strongly recommend that you apply for the visa with a COE. The following is the outline of the visa acquisition procedure with a COE. To apply for a COE, you need to follow the steps outlined below. Download an Application Form for Certificate of Eligibility and fill out the form according to the sample. After completing the form, send the file to the departmental staff or your academic adviser. Also, send a copy of your passport showing all basic information, your photograph and documents to certify that you can defray all the expenses incurred during your stay. (Please see here.) Then, the departmental staff or your academic adviser will apply for the COE with the documents you sent. After one and a half months, the COE will be sent to you. Then, please go to the Japanese Embassy/Consulate nearest to your residence and apply for the visa with the COE. As you are required to submit several documents as well as the COE at your application, please check the website of the Japanese Embassy in your home country and prepare them beforehand. To change the status of residence of your visa to "Student"
If you are now residing in Japan with a "Cultural Activities" or "Dependant" visa, please be sure to change your present status of residence to "Student". If you are now residing in Japan with an "Engineer" visa, please change your status of residence to "Student", unless you are going to be enrolled as a Working Student. The "Engineer" visas are basically issued to foreigners under employment contract with employers in Japan. As you are going to be enrolled in SOKENDAI as a student, you should change the status to "Student", which fits the purpose of your stay in Japan. If you are residing in Japan with a "Spouse of Japanese" visa, it is not always necessary to change the present status of your visa. However, please be reminded that without a "Student" visa, you will be ineligible for most of services for international students. Those who are going to change the resident status of their present visas should file the application at the regional immigration office in person. The required documents for the application include an application form issued by SOKENDAI as well as an application filled out by the applicant. Please read the following instruction for the details. Download the Application Form for Change of Status of Residence below ('Required documents' 1.) and fill out the form according to the sample. After completing the form, please send the file and an Application Form for Certificates to your department office. The department office will forward the documents to the Student Affairs Section in Hayama. You will receive the sealed application form from SOKENDAI about one week after your submission of the file. Please go to the regional immigration office and submit the form and other required documents. A Photograph Please paste it on the application form. *You may be required to submit other documents such as an Admission Permit issued after your payment of registration fee. If you submit the application after your enrollment, you should submit a Certificate of Enrollment instead. Applications are accepted three months before the expiration date of the present visa. You need to go in person to the regional immigration office in charge of your department's address and apply for the extension. The required documents for the application include an application form issued by SOKENDAI as well as an application filled out by yourself. Please read the following instruction for the details. Download the Application Form for Extension of Period of Stay below ('Required documents' 1.) and fill out the form according to the sample. The departmental staff will forward the documents to the Student Affairs Section in Hayama. A special exception shall be made for those who has filed an application by his/her expiration date of residence, yet has received no official decision on the application by the said date. In such case, he/she is allowed to stay until the day the decision is made for the application or two months after the expiration date, whichever comes earlier. However, you will be considered as an illegal resident if you continue to stay in Japan more than two months after the expiration date of your current visa, even if you haven't received the result of your application by then. The application can be filed three months before the expiration date of your current visa. Please try to submit applications ahead of time. *The non-degree students who have a 14-hour Work Permit should engage in work within the present limit. If you wish to have the limit of the work permit extended to 28 hours per week, you are required to reapply for it to the Immigration Office. You are NOT allowed to work at an adult entertainment service sector such as a hostess bar or a cabaret, where an attendant serves customers at their table, or a gambling establishment, e.g. a pachinko or game parlor. Those who are newly entering Japan may apply for a work permit during the immigration procedure at the arrival airport. Please see here for more details. After 2010, in stead of issuing a paper permit, a seal of work permit is affixed to your passport. Please be sure to bring your passport when you go to receive a work permit. When leaving Japan for a short period of time, you are required to obtain a re-entry permit at the Immigration Office before leaving. However, if you fulfill the following two conditions, you do not have to do so. This system is called "a special re-entry permit". In this case, please show your Residence Card to the immigration officer during the embarkation procedure. The special re-entry permit system also applies to those who possess a valid alien registration certificate. If your period of stay expires within 1 year of your departure, please ensure that you re-enter Japan before the expiration. If you do not fulfill the above two conditions (e.g., you are going to leave Japan for more than a year), you have to obtain a re-entry permit before leaving Japan. Otherwise, you will be required to obtain a new visa to re-entry Japan, which will take you more than one month. Please make sure that you carry the Residence Card during the immigration procedure. You should pay the fee by revenue stamp, which should be affixed to the Form for Payment Notice. A Re-Entry Permit is issued on the day of application. 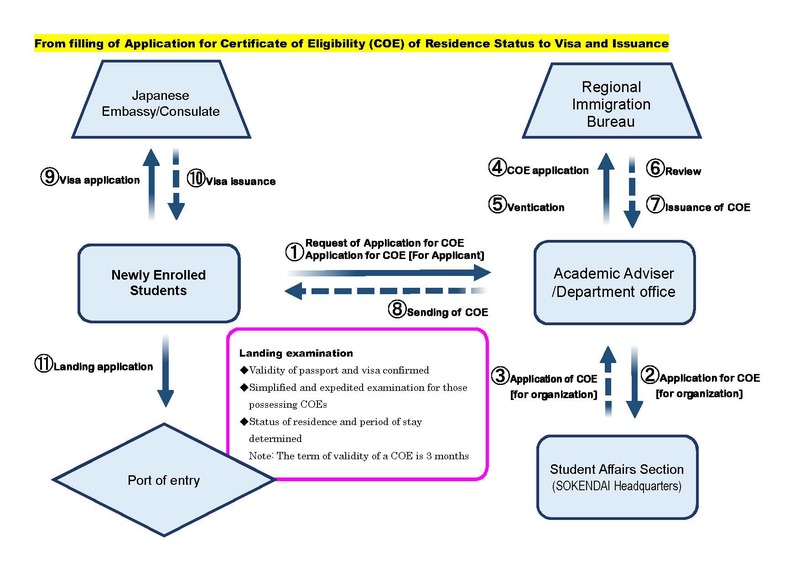 If an international student with the residence status 'Student' wishes to continue his/her residence in order to seek employment after graduation and also he/she has been recommended as such by the university he/she is enrolled in, a change of visa status to "Designated Activities"(Period of stay: 6 months) is permitted, as well as a one-time extension of the visa, thus a stay for a period up to one year is possible. *This system is not applicable to non-regular students. Diploma or graduation certificate from the university graduated. Documents confirming that the applicant is actively seeking employment. When you need the letter of recommendation regarding job-searching after graduation, please submit the Application Form for Certificates. When you submit the form, please submit something to verify your present address such as a copy of your Residence Card. International students who have acquired "Designated activities" status with the intention of engaging in full-time employment may apply for "Permission to Engage in Activity Other Than That Permitted under the Status of Residence Previously Granted" and work up to 28 hours a week. In order to apply for "Permission to Engage in Activity Other Than That Permitted under the Status of Residence Previously Granted," a letter of recommendation from the university is required. When you change your residence status to 'Designated Activities', your family members with dependant visas are required to apply for a change of states to "Designated Activities" at the same time. What procedures should be followed after entering into Japan? Mid- to long-tern foreign residents in Japan will be issued a Residence Card after being granted landing permission at port of entry. During your stay in Japan, a Residence Card serves as one of the most important IDs, along with a passport. You are required to carry it with you at all times. Residence Card will be issued at Narita, Haneda, Chubu, and Kansai airports. Those who landed at other ports, a Residence Card will be mailed to them following certain procedures. Note: For those who entered Japan on or before July 8, 2012, their current alien registration certificate will be deemed equivalent to a Residence Card for a certain period after the enforcement of the amended law. Please note, however, that this transitional measure will only be in effect until the expiration date of your period of stay. If you are going to be enrolled in SOKENDAI continuously after the expiration date or if you are going to engage in other activities than research/study in SOKENDAI, please make sure to apply for an extension of period of stay/change of resident status. In such instances, you will return your alien registration certificate to the Immigration Office and be given a Resident Card instead. After being issued a Residence Card, you are asked to visit the municipal office of your area of residence and notify them of your address within 14 days of deciding on a place of residence. After completing this procedure (called as "Jumin Touroku" (Resident Registration)), you will be able to acquire a Resident Record (Juminhyo), which is necessary to open a bank account in Japan. Public welfare services such as National Health Insurance or Childcare Allowance are also provided based on this Resident Registration. If you are going to stay in Japan for more than one year, you are also requested to follow procedures for enrolling in The National Health Insurance. What should I do if there is a change to information on my Residence Card? A medium to long term student with a status of residence of "Student", who has left an accepting organization he/she belongs to or moves into another organization in Japan, need to submit the notification form to the Immigration Bureau in 14 days. This notification is required by law, please make sure to submit it by yourself. For more details, please refer to the Immigration Bureau website. Please bring the notification form to the Regional Immigration Office in charge of your address (Please ask the Regional Immigration Office or the Immigration Information Center). (Postal Address) Notification Reception Resident Management Information Department Tokyo Immigration Bureau 5-5-30 Konan Minatoku, Tokyo, 108-8255 *Please write "The notification form is enclosed" in red letters on the envelope. A "Student" residence status is authorized to those who engage in receiving education at educational institutions in Japan. If you stay in Japan while taking a leave of absence from the University for over 3 months with a "Student" residence status, you will lose your status by the act (Article 22-4, Immigration Control and Refugee Recognition Act). You are required to either depart from Japan immediately or complete the necessary procedures to change the residence status unless you have a legitimate reason to continue to stay in Japan which is considered by the Immigration Bureau. Taking a leave of absence due to financial reasons is not considered as a legitimate reason. In addition, you are not allowed to engage in part-time jobs with a 'Student' status while taking a leave of absence. In any case, if you need to stay in Japan while taking a leave of absence, please consult with the Immigration Bureau in advance. If your period of stay has expired while being out of Japan, you are required to obtain the Certificate of Eligibility (COE) again. As the examination takes time, please contact your department office by 3 months before your return from a leave of absence and complete the necessary procedures.